According to Prosthetics Orthotics Society-Nepal, at the moment, there are only 11 certified Nepali Prosthetists Orthotists in the country. But even before we begin to brood over the circumstance, Anita Lama, the only certified female Nepali Prothetist Orthotist so far, is certain many of the Nepali public will have to be informed what the title actually refers to. And yet the 2011 census released by the National Federation of the Disabled showed 17,122 handicapped people in our capital alone. There is a massive need for prosthetic limbs but still the likes of Lama share that they have become used to the ignorance. At Limb Care Nepal Pvt. Ltd, her office, she does everything from assessing patients to sculpting their prosthetic molds and even assisting them with the rehabilitation process. She is regarded as a clinical professional and her job requires her to prescribe medicines, operate special tools as well as provide emotional support to her patients. One of her recent patients, Tsering Lama, though thought way more of her job. After a foot infection lead to an amputation, he had been hobbling around in crutches. Now though as he can walk on his own, he is spending his days helping his wife with their business. He thanks her for helping him get a second lease of life. But again, we come back to the fact that currently there are only 11 certified Nepali Prothetists Orthotists in the country. We can see how it isn’t feasible to professionally supply the necessary standardized prosthetics to those in need. Managing Director of Limb Care Nepal, Amit Rana Bajracharya, doesn’t deny the assumption. In fact, he thinks it’s a statistic that needs to be spread to prove the inadequacy of available services in our country. Bajracharya starts by noting that it’s very common for people to be shocked that his clinic is a private one, meaning he insists on patients to pay for their prosthetics. He apparently has to explain his decision even today because many patients that come to see him or organizations that would like to tie up with his work expect him and his staff to be working for free. As it is, the first use of prosthetics in Nepal can be traced back to nearly 50 years and that too was a donation for a patient made by a foreign doctor at Palpa Mission Hospital. After that, it was usually soldiers from the British Gurkha who were supplied with second hand prosthetic limbs and in 1972 when German donors started a prosthetics workshop that too was a charity of sorts. Without proper vision from our Health Ministry, artificial limbs have largely been categorized as donations. The likes of Lions Club and Rotary Club have been known to actively organize camps to distribute prosthetics. Hospitals and other organizations especially after the 2015 earthquakes have been known to pitch in with similar concepts every now and then as well. This attitude is so rampant that it has even limited employment opportunities for certified Prothetists and Orthotists. 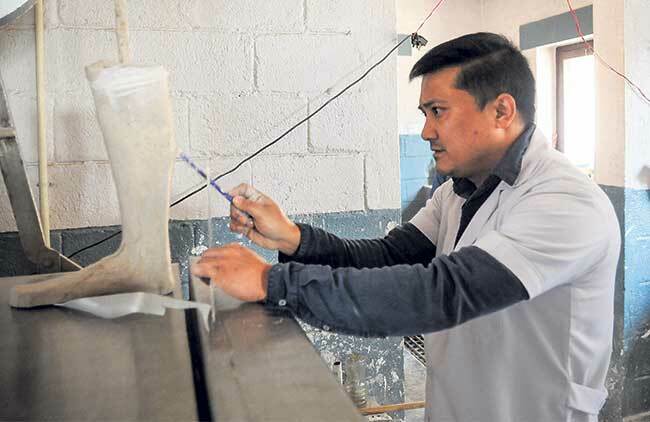 Bajracharya explains that many organizations prefer to simply hire technicians who have learned how to mold artificial limbs than professionals who have actually majored in the subject. Apparently, he was once told, he would be too expensive to hire. Lama also reveals that she didn’t work for nearly six months after she returned from Bangkok where she completed her studies. She adds that another one of her peers too has recently decided to set up his own clinic because he couldn’t find a vacancy for himself. “All these factors together has hindered the chances of development in the field,” says Bajracharya adding that it is also the reason he firmly stands behind his decision to ask his patients to pay. A below the knee prosthetic leg for instance starts at Rs 35,000. Rather than measuring a patient’s stump and handing out generic artificial limbs that has mostly been the case, the team at Limb Care Nepal is advocating for a more standardized quality service. Patient Tsering Lama explains he had to sit through a series of tests and several rounds of counseling during his treatment process. Along with evaluating his muscle strength, range of motion, joint motion, he also had to answer questions about his personal and professional life. However, both Bajracharya and Lama also give their patients a word of caution. 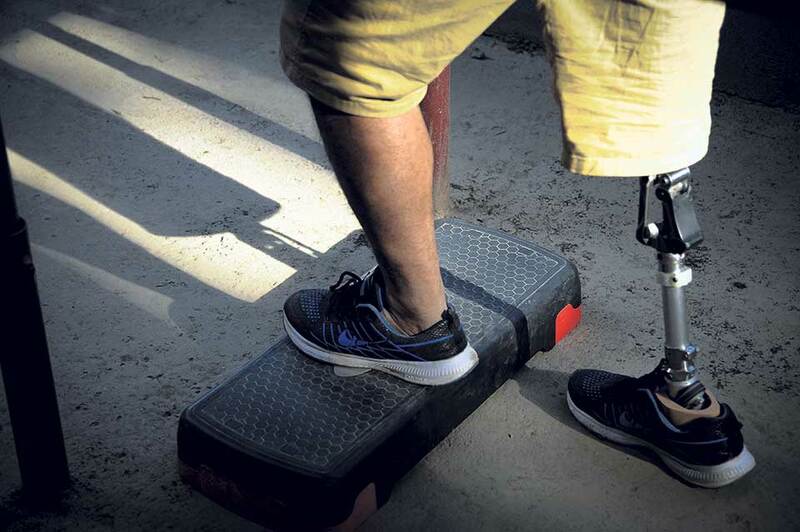 It’s not the artificial limb that is going to make you walk or pick things up from a table. There is a fair bit of effort required. But, they have had many patients who assume that it is only a matter of putting on the prosthesis. This is one of the reasons why Lama and Bajracharya only take in one patient at a time. The patient spends an average of two to three hours practicing at the parallel bars placed in the clinic’s courtyard. Ramesh Dhugana is their latest patient and he is about to complete his first week of rehab. The patients there have at least 10 days of rehab at the clinic, and some may even require 15 days. Dhugana has only managed to walk a couple steps from the beginning to the end of the bars with its support. But still, he is believed to be on schedule. Lama and Bajracharya, who have been helping him, seem confident that he will be one of the easier cases. They reason that they have already seen the most important indicator: his smile. “We always wait for patients to start smiling again. That’s when we know that we have earned their trust and most importantly, they have started believing in themselves as well,” explains Lama. Lama doesn’t try to pretend that assisting with the rehabilitation is easy. According to her, there are always a lot of emotions involved, the biggest of it being frustration and doubt. She confesses to feeling frustrated every now and then too when patients wouldn’t properly carry out the exercises and bandaging techniques that they have been taught because it often leads to delay in their own treatment. But she says, those instances have also taught her a lot about practicing empathy. percent of those who come to seek their help can afford good quality prosthesis. The rest have to make do with inferior materials and treatments that don’t allow them to reach their full potential. It’s apparent that the field of prosthetics and orthotics is suffering from years of severe neglect. But with a new mindset of privatizing their clinics, a few of the handful of certified Nepali experts in the field want to establish the credibility of their occupation.